It’s a good time to be involved in South Jersey’s manufacturing industry. Food manufacturers in Gloucester County, for example, are expanding and looking to fill about 500 new positions right now, according to Gloucester County freeholder Heather Simmons. And food manufacturers aren’t alone on their quest for talent. Manufacturers in construction are also hoping to drive their businesses forward with new hires. “We’re expanding our sales force to handle the extra demand and we have a bunch of positions that if I could just find the right people for, I would hire them today,” says Bob Brown, president and CEO of American Asphalt Company in West Collingswood Heights. Companies in the defense manufacturing and machining sector are in a similar position. 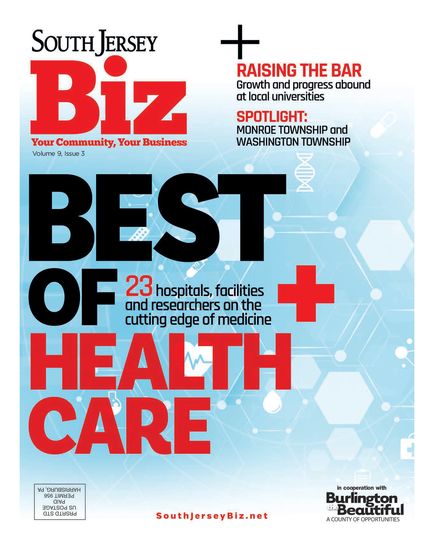 “We’ve had positions open for a significant amount of time because we can’t seem to find the skilled workforce to meet our needs,” says Sheila Harris-Adams, vice president of government business development at Parts Life Inc. in Moorestown. Manufacturers believe companies’ South Jersey location as a midway point between New York City and Washington, D.C., and the combination of rails and ports, with strong infrastructure to move products along, all come together to make the region a prime spot for manufacturing. In addition, recent tax incentives that are bolstering the manufacturing industry, particularly in food manufacturing, as well as stronger educational programs that are providing hands-on apprenticeships and job placement after completion, are all contributing to the industry’s recent growth. While manufacturers across industries will agree that talent is rare these days, they’ll also agree on some other factors: Their jobs are exciting, growing and full of opportunity. Manufacturing companies are working on strengthening their relationships with nearby schools to develop programs tailored to their needs and provide on-the-job experience. Rowan College at Gloucester County was recently awarded the Department of Labor’s Opportunity4Jersey grant to develop training in the area of processed technology. The school will work with local refineries to help provide hands-on experience and facilitate job placement at completion of the program. Camden County College also received an Opportunity4Jersey grant designed to build a pipeline of prospective employees in three of New Jersey’s key industry sectors: manufacturing, transportation and retail, hospitality and tourism. Manufacturers are also collaborating with Rowan College at Burlington County to establish a certification program for machinists. “There’s a gap in the workforce, and we need to find a way to train people to step into people’s shoes so that we don’t lose all that information when they retire and those positions can’t be replaced,” says Harris-Adams. In defense manufacturing, companies like Parts Life Inc. are especially on the lookout for problem solvers who can find unique ways to be resourceful. The defense manufacturing industry is faced with the challenge of being able to extend the life of assets, such as military equipment, while keeping it up-to-date for safety. In many cases, those who originally worked on these assets are no longer in the workforce, so employees are being asked to come up with new ways to keep this equipment in service. Manufacturing professionals believe there are some real technology-driven opportunities that might appeal to today’s generation just coming out of school. “Sure, manufacturing might not be the most glamorous job, but I don’t think kids coming out of school realize how much computerization is involved in manufacturing,” says Brown. Brown says some of these positions might start at $15 an hour, and workers can quickly make double that if they’re working hard and learning. He says it’s an industry where after putting in a little time, people can find they’re making $50 an hour, or $2,000 on a good week, and can also have that sense of accomplishment that they helped create and build something. The manufacturing industry, particularly in sectors such as defense, is also focusing on finding opportunities for veterans. “We have a lot of qualified veterans here in New Jersey that we need to find a way to get back to work,” says Harris-Adams. She says the company is working to bring these individuals into positions for growth and to contribute to the community. “It’s unfortunate that so many veterans are still looking for jobs, but as companies find new ways to give veterans opportunities within their organizations, there’s hope things will get better,” she adds.